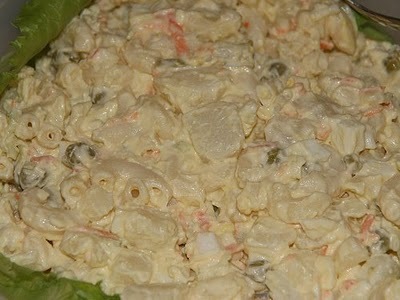 This Haitian Macaroni Salad is creamy and delicious. Special thanks for submitting this recipe. Boil potatoes with skin. Once cooked, let it cool down, then unpeel and dice in cubes. In a separate pot, boil water with salt and add the pasta. Combine the chopped onions, ham, petit pois and bell peppers. Add the potatoes and pasta. While it’s still hot, add the mayo to coat the salad. Stir in the seasonings, cream cheese, honey mustard, and La Vache Qui Rit cheese. Sprinkle a pinch of seasoning on top of the salad. Refrigerate to serve cold.